God’s story is a central theme for EPiC Church which held its grand opening in Torrance, CA, on September 4. This church is, after all, in the city that is writing and telling stories for all of America and the whole world to consume. What better place to tell the story of life with Jesus as its hero? 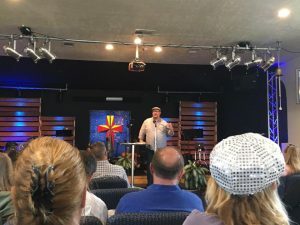 For now, EPiC is making itself at home on Sunday evenings in the NewLife Church building on Sepulveda and during the week at the Alano Club for Celebrate Recovery. Nearly a month after their launch with about 100 people present, EPiC has settled into a group of about 30 meeting on Sundays. There’s Freddie, who came for Celebrate Recovery and stayed to help lead worship. There’s Moon, who hasn’t settled on what her own faith looks like, but who brought 6 people to church at EPiC because it feels like home. Click here to visit their website and know what’s going on.